Originally printed on January 25, 2019 in the Cambs Times. 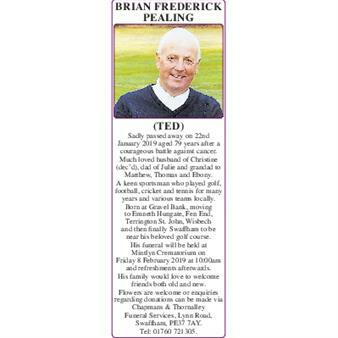 BRIAN FREDERICK PEALING (photo) (TED) Sadly passed away on 22nd January 2019 aged 79 years after a courageous battle against cancer. Much loved husband of Christine (dec'd), dad of Julie and grandad to Matthew, Thomas and Ebony. 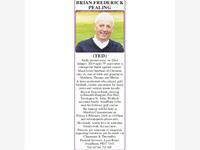 A keen sportsman who played golf, football, cricket and tennis for many years and various teams locally. Born at Gravel Bank, moving to Emneth Hungate, Fen End, Terrington St. John, Wisbech and then finally Swaffham to be near his beloved golf course. His funeral will be held at Mintlyn Crematorium on Friday 8 February 2019 at 10:00am and refreshments afterwards. His family would love to welcome friends both old and new. Flowers are welcome or enquiries regarding donations can be made via Chapmans & Thornalley Funeral Services, Lynn Road, Swaffham, PE37 7AY. Tel: 01760 721305.